a great presenter. It's a powerfull tool for online and offline presentation. It is not so easier than ever to create an animated video presentation with Animiz presentation maker, whether it is for a marketing program or an educational lecture. There are many animation effect options for your content description in the scene. Even you are allowed to add awesome hand-drawn animation effects to make your video presentation looks more fascinating. It is really an effective way to say goodbye to a still presentation. In the process of your design, you will have more choices to make a media rich video presentation. You are not only able to add text, shapes, music and local videos to the presentation like other presentation maker, but also embed chart, formula, flash, symbol, actors as you wish. These media description can really bring a broader digital content and help to grab more attention. There are a great many of built-in roles in the Animiz which allow presenters to insert in different scenes to give ideas and express thoughts. Each character has different actions and expressions and all of them are at your disposal. Besides, you are able to customize roles by yourself: choose a destination role, add actions for it and then make it perform in the scene. Animiz provides different publishing channels for a generated video presentation. You can publish the presentation online to make it effective for sharing. Or you can choose to create high-definition offline videos to view anytime and anywhere. There are 6 different formats for offline video: .mp4, .mov, .wmv, .avi, .flv, .mkv. 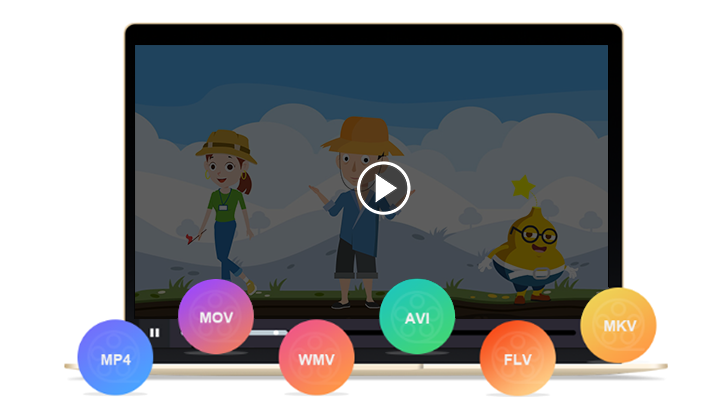 Take a format according to your need, and then publish your animated video presentation to make you easy to enjoy offline viewing experience.